We are off to a celebration. An event created over time and spanning generations. Everyone is welcome, people and herds will join together at this gathering. It is not a wedding, it is an expansion, a growth in conservation. 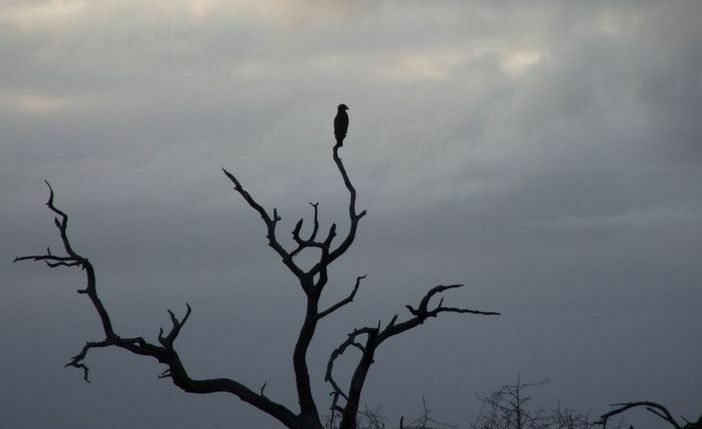 The Old comes in the form of Hluhluwe-Imfolozi Park, the oldest proclaimed nature reserve in Africa. 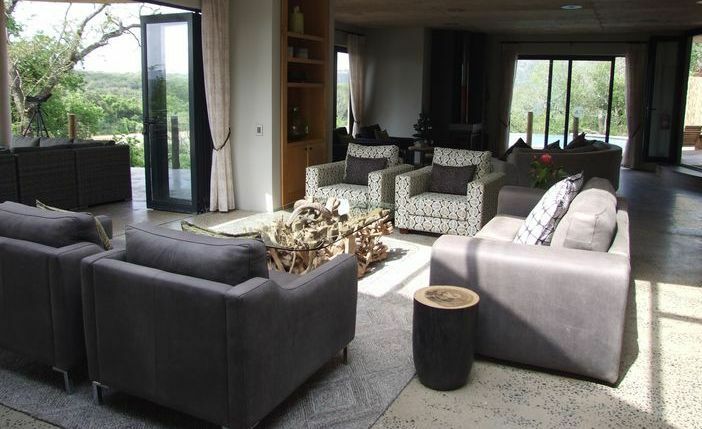 The New is Umfolozi Big Five Game Reserve and Mthembu Lodge, our destination. The borrowed, that is our car, borrowed from my mother-in-law. And the blue is the African sky we drive under for the duration of our journey from the Indian Ocean coast to the reserve’s new entrance. We are back, deep in the heart of the old Zulu Kingdom, surrounded by history and culture. 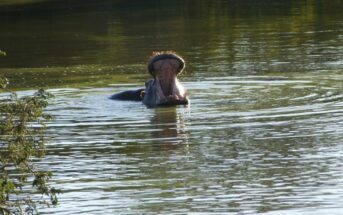 It had only been five months since my last visit, and again, I was going to be sleeping on the banks of the White iMfolozi River. There were to be significant differences, firstly the sleeping bag on the ground was gone, replaced by a luxury king size bed with the crispest of white sheets. My wife Melanie was travelling with me making this an extra special trip. We made our way, through the rolling hills of Zululand, scattered with traditional rural homesteads, most with vegetable patches dominated by maize. Maize, or mielie-meal, being the main staple in the Zulu diet. People we passed waved and smiled, cattle and goats crossing our path and grazing on the verges totally ignored us. We were counting down the kilometres to our destination, thirty-five south from Ulundi, the once capital of the kingdom. On arrival at the gate, where the final touches were nearing completion, we were greeted by ranger Chris & tracker Musa. Under the shade of a thorn tree we took a cool drink and were welcomed to Umfolozi Big Five Game Reserve. 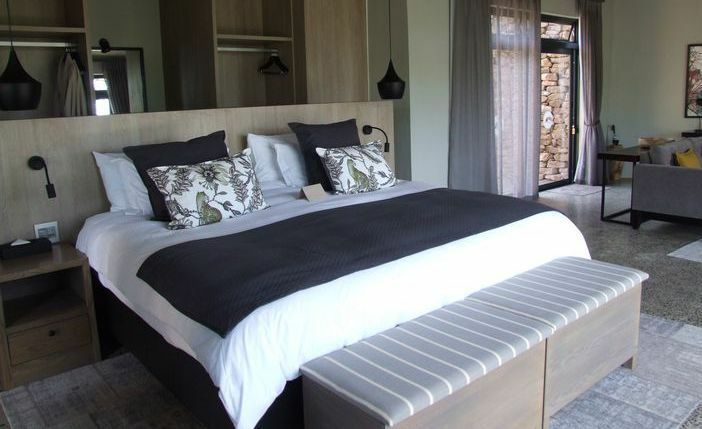 The reserve joins the Hluhluwe-Imfolozi Park, separated only by the White Imfolozi River, and a stones throw from the park’s wilderness area. Game fences that once kept the park’s wildlife inside the park are now being removed to allow animals to move freely, into what is effectively an expansion of land under conservation. 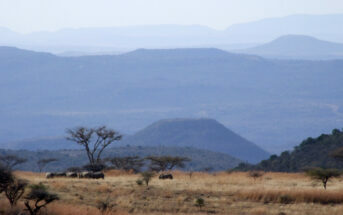 The oldest proclaimed reserve in Africa is world famous for ‘Operation Rhino’. Under the supervision, passion and commitment of Dr Ian Player and his team, the southern white rhinoceros was saved from extinction. His work continues today in a monumental effort, once again, to protect this critically endangered species from extinction. In those early days of conservation Dr Player spent many hours on patrol on horseback. 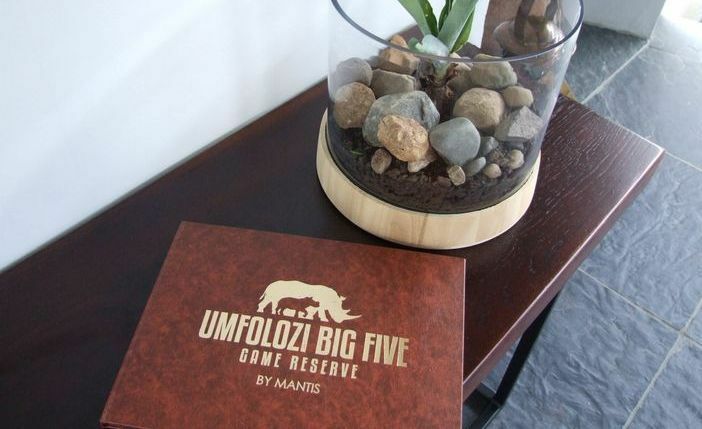 The stables where he kept his horses are within the new Umfolozi Big Five Game Reserve. The Big Five in the reserve’s name, you would automatically think comes from the reference often made to the most sought after five animal sightings in Africa: Elephant, lion, buffalo, black rhino & leopard. The phrase dates to colonial hunters as these five were deemed the most difficult and dangerous animals to hunt. Here however the five are the local tribal chiefs who, using their foresight and wisdom, have put their land into the hands of conservationists, allowing expansion, and the development of a new reserve complete with lodges. The chiefs have carried on a legacy of protecting their land that goes back two hundred years. King Shaka, on settling here, understood conservation. He and his people only took what they needed from the land and Shaka’s Spring, where the King sat and drank fresh water, still flows to this day. We passed it several times and it now makes a perfect water hole or wallow for resident wildlife. Thank you to Chief Mthembu and his people, because our home for the next few days would be Mthembu Lodge. From here we will have the chance of encountering Africa’s big five of the animal kingdom, plus the of other wildlife the reserve is home to. The main lodge and rooms are fit for a king. Any royalty would not look out of place stepping foot inside. There is no shortage of space. On entering reception, you cannot help but be overwhelmed by the size and decor. Light floods in from full height windows and sliding glass doors. It is all open plan with a lounge area leading to a dining area. There is a mix of tiles and Polished concrete floors, with natural rugs strategically placed around comfortable chairs and sofas. The emphasis is on natural. Drift wood supports glass top tables and wooden ornaments sit on reclaimed table tops. There is no clutter. Large botanical works of art are the biggest features, strategically placed around the lodge. 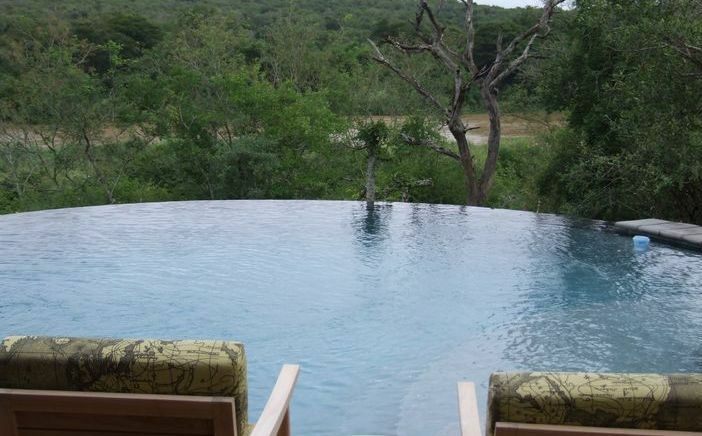 Beyond the glass is a large deck overlooking the White Imfolozi River. Sitting here you have the chance of seeing animals. The surrounding trees and reeds are a haven for birds. Here you can eat breakfast or lunch under the shade of an umbrella or take dinner under a starlit sky. 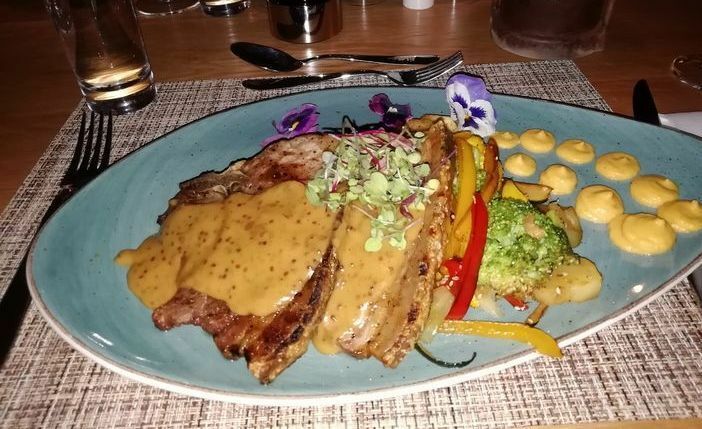 The food is exceptional and would not be out of place in a five-star restaurant. Breakfast and lunch are a mix of cooked to order and buffet. There were options at dinner to suit both us and we were both keen to sample what the other had chosen. We over indulged at meal times, not wanting to miss anything that was served to us. The lodge also offers a wide selection of beers, wines and spirits. We even tried a Sauvignon Blanc made with the blessing of the Zulu King. 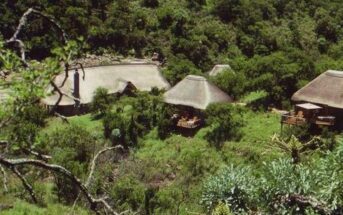 Our room, a very short walk from the main lodge, “number 4 King Cetshwayo” was much like the main lodge. Spacious, laid out perfectly, and decorated in keeping with its surroundings. We had our own lounge area, king size bed, bathroom with twin sinks, bath and shower. Our personal deck, made private by stones walls, again looked down onto the river. Following the deck to the stone wall was an outdoor shower. There is nothing like showering outside for me when on safari. Game drives take you through the Umfolozi Big Five Game Reserve and beyond into the Hluhluwe-Imfolozi Park. 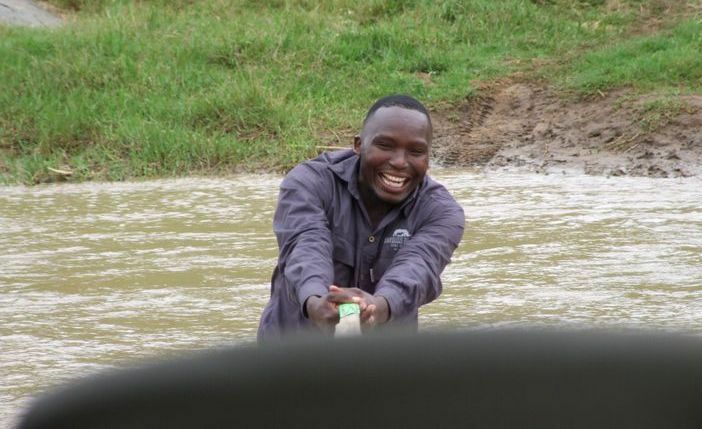 I have never been to any reserve where we have crossed a flowing river to access other areas. This proved a thrill but did not always go to plan. Water, winches and Nile crocodiles kept everyone on their toes. We were not the only ones to use this access. We encountered elephants and large herds of buffalo. Because of the proximity to the Imfolozi Wilderness area, large game reacted very differently to what I was used to. Most of the wildlife here has rarely encountered game viewing vehicles, making them nervous and skittish. The landscapes and terrains we crossed were like fifty shades of green, with a huge variety of vegetation. 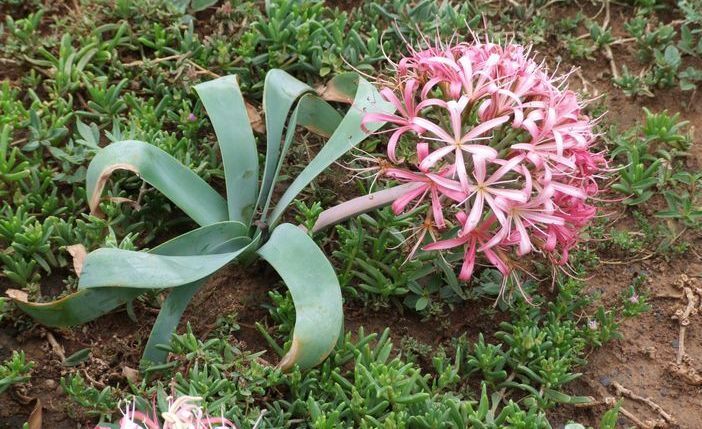 We drove through open areas of grassland where pink ground lilies, from the ‘Brunsvigia’ family, flourished. There was abundant wild asparagus and the regular smell of the potato bush. A first for me was to watch a terrapin in its nest preparing to lay its eggs. Slender Mongoose and scrub hares made casual appearances. It is a birders paradise and I was thrilled as during dawn and dusk we came across dozens of fiery necked and square tailed nightjars. The foresight of all those involved in this relatively new development is impressive. The investors and developers working to construct lodges with minimal impact, striving towards ecological sustainability. The chiefs and their tribes for investing their land, that they have conserved for generations, upholding the beliefs of previous Zulu kings. Tourism is vital to the economy, especially in rural areas. Most reserves, alongside experienced staff, recruit from local communities. Communities where employment chances can be very limited. Staff are trained in all areas, from construction, and maintenance, to chefs and front of house. A special thanks goes to all those involved in the planning stages, then to Dave & Christine, for ensuring we were more than well looked after. 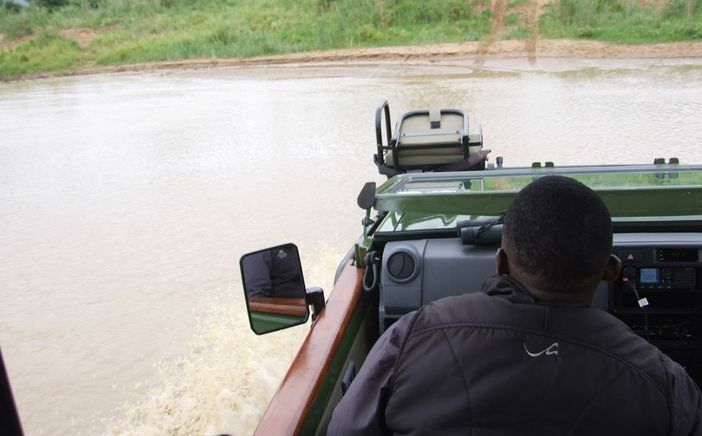 Chris our ranger, for his driving skills and Musa our tracker for having the most amazing eye sight. And finally: Nomvola, Palisa, Sthembile, Elija, Celiwe, Joel.